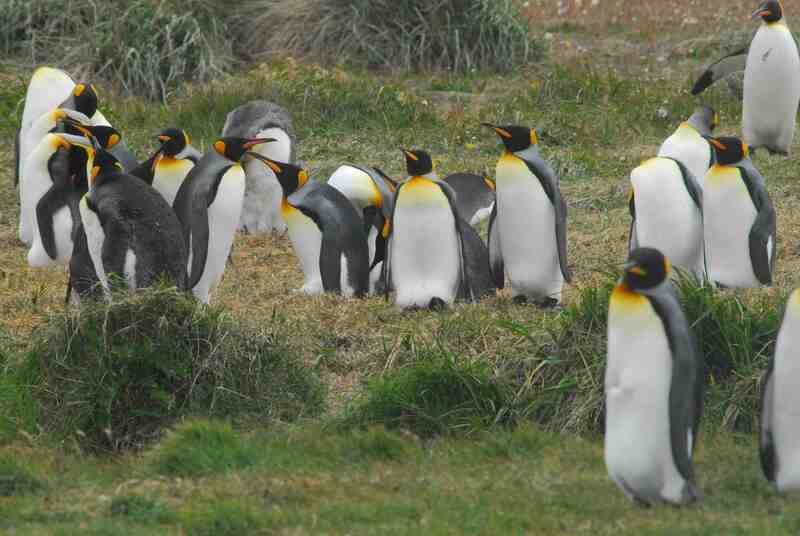 King Penguins, Tierra del Fuego, Chile. Photography: Dr. Charles A. Munn. 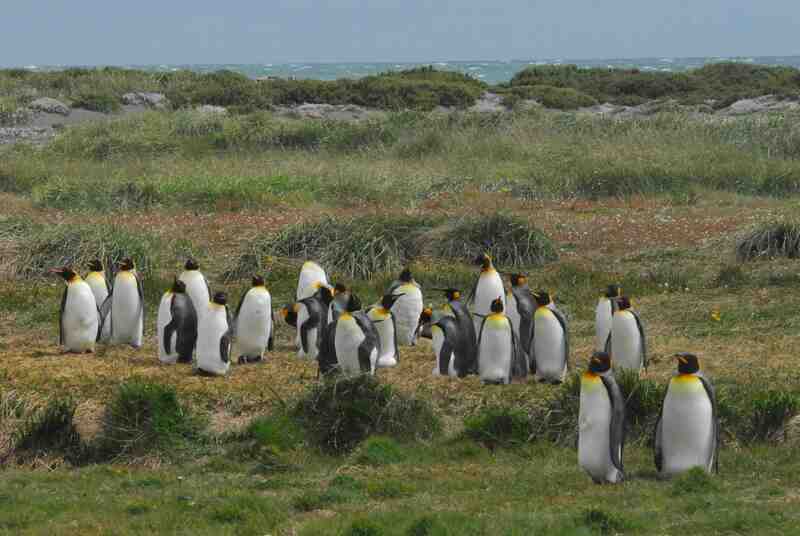 King Penguin Wildlife Photography Tour. The price includes escorted transfers, excursions with a naturalist guide, entrance fees, specified accommodations on night of Day 1, all meals (without beverages) from breakfast on Day 1 through breakfast on Day 4, as well as all land, water and air transportation. All prices are per person based on two people sharing a guest room. Punta Arenas – Porvenir – Punta Arenas flights will be used on Monday through Saturday, and are included. The flight is best arranged in combination with your international air tickets. Monday, Day 10: Punta Arenas (Magellanic Penguins). Breakfast. Magellanic Penguin experience all afternoon. From start to finish, the outing is 6 hours long. Return to Punta Arenas. Overnight in the Hotel Diego de Almagro – King Size Double Room. B, Box lunch. Tuesday, Day 11: Punta Arenas – Tierra del Fuego. Breakfast. King Penguins (Aptenodytes patagonicus) are not known for inhabiting Patagonia but for taking to the shores of northern Antarctica and the sub-Antarctic islands (such as Prince Edward, South Georgia and Macquarie). However, they can be seen on Tierra del Fuego’s west coast, overlooking the Strait of Magellan, which joins the Pacific and Atlantic oceans. We can see and photograph them in their natural environment, from a distance of 10 to 35 meters. If a Monday through Saturday, transfer to the airport for a 12-minute flight in a Cessna 402 from Punta Arenas to Porvenir, on the island of Tierra del Fuego. If a Sunday, transfer to the port for the two-and-a-half-hour crossing on the Crux Australis ferry. During the voyage, we may see Commerson’s Dolphins jumping alongside us, guiding us towards the island known as “The End of the World”. Upon arrival in Porvenir, we check into the hotel. From there, it’s a one and one-quarter hour drive on dirt roads flanked by fields full of Guanacos and woolly Corriedale Sheep to King Penguin Park, a 125-acre plot on the 25,000-acre Estancia San Clemente sheep farm. Our hosts for the private visit to the park are the farm’s owners, Alejandro Fernández Vogelhummer and his family, who will meet us late this morning. We make a bee-line for the birds and find ourselves immediately engrossed by the three-foot tall colony of about 80. The deep yellow markings around their necks, heads and on their beaks make King Penguins the brightest of all the penguin species and set them apart from Emperor Penguins (Aptenodytes forsteri). 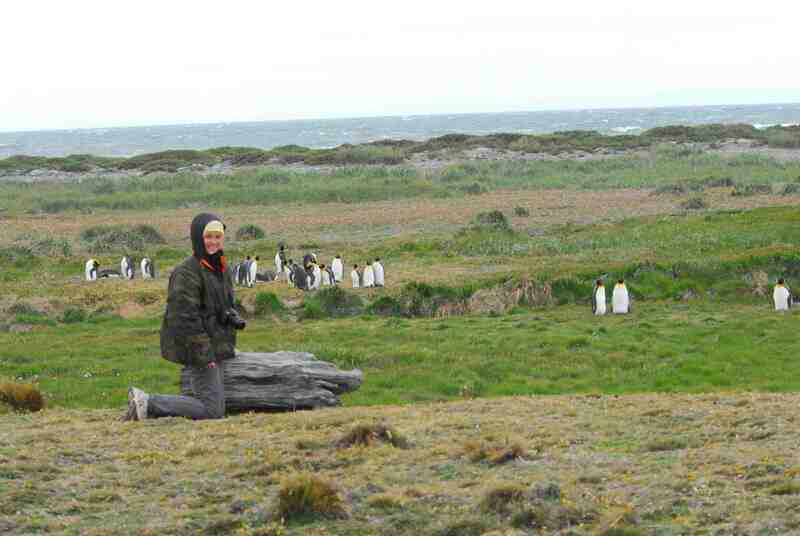 During the first part of the visit, we will be with other guests at a distance of 20 to 60 meters from the penguins. Then, afrer all of the other guests depart, we can set up positions closer to the penguins, in a special arrangement with the owners that is available only to our guests. Right after sunset, we return to Porvenir and our hotel. Dinner and overnight in the Hostería Tunkelén – Double Room. B, Box lunch, D.
Wednesday, Day 12: Tierra del Fuego – Punta Arenas. Box breakfast. Depart Porvenir one and one-half hours before sunrise. Box breakfast on the way. Arrive at King Penguin Park in time to take photos of pairs and small groups walking down the beach in the earliest morning light. The King Penguin viewing is private and up close — from a distance of 6 to 15 meters. Around 11 am, if a Monday through Saturday, transfer to the airport for a flight back to Punta Arenas and return to the hotel. If a Sunday, transfer to the port, take the ferry back to the mainland at Punta Arenas and return to the hotel. Dinner and overnight in the Hotel Diego de Almagro – King Size Double Room. Box breakfast, Box lunch, D.
Thursday, Day 13: Punta Arenas – Santiago. Breakfast. Transfer to the airport and check-in assistance for your flight to Santiago and connection home. B.